Double standing cup; silver-gilt; embossed and chased; lip of one cup fitting into that of the other; both identical in design; vertical lip with etched border of interlacing calligraphic scrolls; below, projecting band with twelve bosses, alternately plain with etched scroll and one with representations of Classical deities in relief; on one cup are Jupiter, Venus with Cupid, and Mercury; on other, Saturn, Mars, and Diana; below this another etched border and three female masks; baluster vase-shaped stem with three S-shaped brackets; three etched bosses and six plain ones under each foot; inscribed. Origin: Nuremberg; mid-16th century; mark of Hans Brabant (master 1535, died 1569). Marks: The two marks (the town-mark and the maker's punch-mark) occur four times: on the foot-rims of both cups and in one of the plain roundels on the vertical lip of each cup. (i) Assay mark for Nuremberg, 1541?, 1550-60 (R3 3758). (ii) Symbols in a circular stamp of Hans Brabant (master 1535, died 1569) (R3 3842). Provenance: Baron Anselm von Rothschild, Vienna, between 1866 and 1872 (cat no. 534), by inheritance to his son Baron Ferdinand Rothschild (d. 1898). Commentary: The maker, Hans Brabant, is one of the finest early Renaissance goldsmiths in Nuremberg. Unfortunately, very little has been published about this goldsmith and, indeed, Rosenberg lists only two other known pieces from his hand, both in Russia: one was in St Petersburg (in 1885), and the other is in the Moscow Kremlin. The latter is a most spectacular tour de force, a great dish of gold and silver, set with six cartouches of mother-of-pearl and decorated with verre eglomisé and enamelled ornament and even with garnets, amongst a rich background of mauresque designs and cast Renaissance relief-work (see G. A. Markowa, ‘Deutsche Silberkunst des XVI-XVIII jahrh, in der Rüstkammer des Moskauer Kreml’, Moscow, 1975, no. 6 with col. pl. and monochrome details). Hans Brabant's double standing-cup in the Waddesdon Bequest is one of the earliest adaptations in the Renaissance style of this very popular, late medieval, Germanic form. Fortunately, the Moscow Kremlin also has an unspoilt and fully documented - but anonymous - Nuremberg example pre-1541 which demonstrates the transitional stage in the evolution of this class of double standing-cup midway between the late Gothic and the fully fledged Renaissance versions. The maker of the Kremlin's early double standing-cup is not known but his style is typical of the designs by Hans Brosamer, published in 1540, and even incorporates some of the elements found in the designs for goldsmiths created by the Regensburg painter Albrecht Altdorfer in the 1520s. The anonymous goldsmith of the pre-1541 cup had already developed the same form of bowl, although he made all the lobes look alike, giving them a burnished finish (see Markowa 1975, no. 4, with col. pl.). The profusion of etched mauresque ornament on various parts of this Hans Brabant double standing-cup helps to confirm the suggested mid-sixteenth-century dating for this Nuremberg example. The use of applied masks on the projecting bosses (in the lower zone of the bowls) is a striking feature of engraved designs for standing-cups by Virgil Solis and, also, those unsigned illustrations in the ‘Neu Kuntlbuch’ published by Matthias Zündt in Nuremberg in 1551 (see J. F. Hayward, ‘Virtuoso Goldsmiths and the Triumphs of Mannerism 1540-1620’, Sotheby Parke Bernet Publications, London, 1976, p. 351, figs 136-7). This particular Virgil Solis engraving demonstrates not only the fashion for innumerable curious protuberances capped by masks, insects and other fantastic creatures, but also the two-tier bulging bowl with a narrow waist in between. A more practical and less fanciful version survives in a drawing bearing the initials of Wenzel Jamnitzer (Germanisches Nationalmuseum, Nuremberg, inv. no. HZ. 19); it could, indeed, be a design for one half of a double standing-cup, and Dr Klaus Pechstein has dated it “um 1550” (‘Wenzel Jamnitzer und die Nürnberger Goldschmiedekunst 1500-1700’, exh. cat., Germanisches Nationalmuseum, Nuremberg, 1985, no. 301, with illus. on p. 344). The bowl of the cup in the drawing corresponds closely in general proportions and forms with the Hans Brabant version, but the latter has the additional feature of the six oval reliefs set in the lobes of the bowls. This fashion for Renaissance sculptural reliefs as ornaments for the sides of the double standing-cups was very probably created by the leading Nuremberg workshops during the middle decades of the sixteenth century. 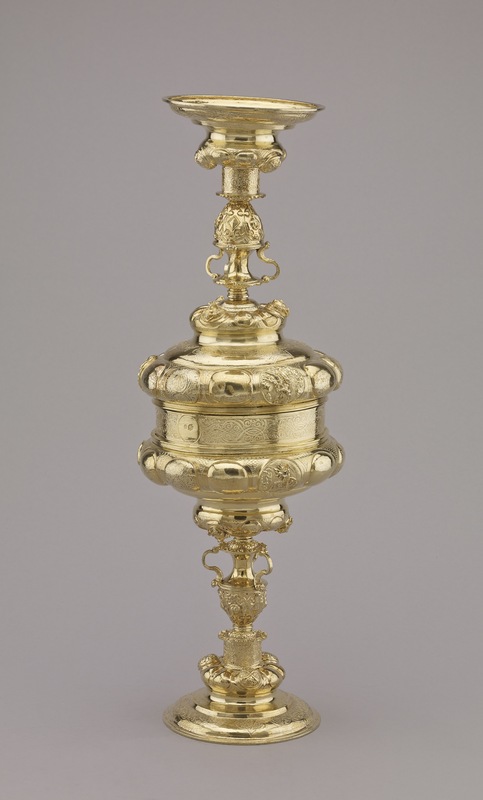 Apart from Hans Brabant's version, few early Nuremberg examples have survived and, significantly, none was included in the 1985 exhibition ‘Wenzel Jamnitzer und die Nürnberger Goldschmiedekunst 1500-1700’, though the Hans Kellner cup (half of a double standing-cup) eloquently represented a later stage in the evolution of this type at the beginning of the seventeenth century (see ‘Wenzel Jamnitzer’ 1985, no. 79, with illus. on p. 257). However, a most interesting comparison can be made with the documented half of a double standing-cup by Elias Lencker (master 1562), which since before 1677 has been recorded in the Moscow Kremlin (Markowa 1975, no. 14 with col. pl. and monochrome detail of oval relief). The Elias Lencker half-cup is clearly some years later than the Hans Brabant double standing-cup, and all the etched mauresque ornament so fashionable in the 1550s and 1560s has given way to an etched foliate running scroll (on the lip) and an engraved foliate design (on three of the lobes). The three oval reliefs on the sides of the bowl are delightful light-hearted scenes of putti enjoying the wine. The three masks protruding from the lower zone of the bowl are, however, little different from those on the Hans Brabant version in the Waddesdon Bequest, although the foot on the Elias Lencker half-cup is far more sober, being almost devoid of ornamentation and Mannerist character. Indeed, in the latest study of Elias Lencker's oeuvre, this half-cup has been dated as late as “um 1575” (see M. Bachtler, Die Nürnberger Goldschmiedefamilie Lencker, ‘Anzeiger des Germanisches Nationalmuseums’, Nuremberg, 1978, p. 118, no. 14). The choice of the Moon and the Five Planets with the Signs of the Zodiac as a subject for the decoration of this double standing-cup is unparalleled. However, the almost universal fascination in both astronomy and astrology throughout the Renaissance led rich patrons to be very familiar with the subject and many, for example, possessed clockwork mechanisms that would show the planetary positions at all hours. Such information was needed in astrology when determining the relationship of the Zodiac with the Twelve Celestial Houses and with the exact position of the Five Planets at any specific time. If, as is often stated, these double standing-cups were popular as wedding gifts because the two parts were intended to be joined together and form a single entity, then this decorative theme of the Planets and the Signs of the Zodiac would have been singularly appropriate (see WB.109 for a further discussion and bibliography). In this period, the Five Planets were frequently listed with the Sun and the Moon to form the seven principal celestial bodies. The absence of the Sun and one of the Signs of the Zodiac, Leo, from Hans Brabant's double standing-cup is puzzling. The most probable explanation is the loss of the appropriate medallion from beneath the foot, for when the cup is joined to its pair it is inverted and the underside of the foot is uppermost and exposed to the gaze. As the tiny engraved roundel with the initials WR (in a shield), which is to be found in the centre beneath the foot of each cup, is not detachable, the age is difficult to determine, but it seems most unlikely that the engraving of the very pointed shields and the lettering on these two tiny roundels is older than the nineteenth century. Therefore, if the two little WR roundels are modern, the goldsmith, Hans Brabant, might have intended a large roundel of Sol with the Sign of the Zodiac, Leo, to fill the space within the upturned foot of the inverted cup - and there is proof that the original set of plaquettes included a roundel of that subject. A full set of these plaquettes of the Planets (including the Sun and the Moon) is not known. However, examples in lead exist in Munich (Bayerisches Nationalmuseum) and Cologne (Kunstgewerbemuseum) of the following: Saturn, Jupiter, Mercury and the Sun (see Weber 1975, p. 87, no. 66, pl. 22). Each of the four lead versions measures 3.7 cm in diameter. Three of the roundels correspond exactly with those on Hans Brabant's double standing-cup, but the fourth roundel depicts the seated figure of Sol, crowned and holding a sceptre, with the lion of Leo beside him. Dr Weber attributed these plaquettes to a Nuremberg workshop in the mid-sixteenth century, in which the influence of the style of Peter Flötner was still strong, but the precise source for these reliefs was not identified. Hugh Tait, 'Catalogue of the Waddesdon Bequest in the British Museum, II : The Silver Plate', British Museum, London, 1988, pl.IV, nos. 12-13, figs. 92-101.